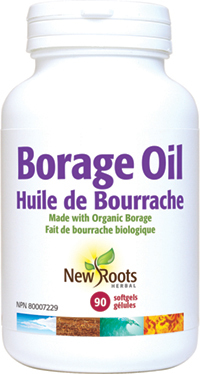 New Roots Herbal’s Borage Oil is sourced exclusively from its seeds. It boasts nature’s most potent concentration of gamma-linolenic acid (GLA), measuring up to 24%. Borage oil owes its health benefits to the presence of essential fatty acids, the most important of which is GLA, an omega‑6 fatty acid. A great deal of scientific research has been conducted with supplements rich in GLA, resulting in significant interest. The essential fatty acids present in borage seeds have proven to impart a regulatory function on the body’s fatty-acid metabolism. Fat metabolism is as critical as the metabolism of proteins and carbohydrates, as evidenced by the drastic rise in obesity-related degenerative diseases, especially coronary heart disease. Current research supports the use of essential fatty acids in promoting optimal health. These natural plant substances have created a great deal of interest in the treatment of numerous health problems. Solvent-free. Not bleached, deodorized, nor refined. Cold-pressed. Other ingredients: Natural vitamin E (ᴅ‑alpha-tocopherol) (from non‑GMO sunflower) in a softgel composed of bovine gelatin, glycerin, and purified water.